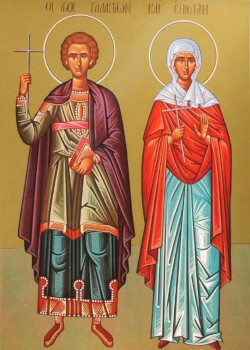 The Holy Martyrs Galaction and Epistemis: A rich and distinguished couple named Clitophon and Leucippia lived in the city of Phoenician Emesa, and for a long time they were childless. The spouses gave over much gold to the pagan priests, but still they remained childless. The city of Emesa in the third century was governed by a Syrian named Secundus, put there by the Roman Caesars. He was a merciless and zealous persecutor of Christians, and to intimidate them he gave orders to display out on the streets the instruments of refined torture. The slightest suspicion of belonging to “the sect of the Galileian” (as thus Christians were called by the pagans), sufficed to get a man arrested and handed over for torture. In spite of this, many Christians voluntarily gave themselves over into the hands of the executioners, in their desire to suffer for Christ. A certain old man, by the name of Onuphrius, concealing beneath his beggar’s rags his monastic and priestly dignity, walked from house to house in Emesa, begging alms. Everywhere where he saw the possibility to turn people away from the pagan error, there he preached about Christ. One time he came to the magnificent house of Leucippia. In accepting alms from her he sensed that the woman was in sorrow, and he asked what was the cause of this sadness. She told the elder about her familial misfortune. In consoling her, Onuphrius began to tell her about the One True God, about His almightiness and mercy, and that He always grants the prayer of those turning to Him with faith. Hope filled the soul of Leucippia. She believed and accepted Holy Baptism. Soon after this in a dream it was revealed to her, that she would give birth to a son, who would be a true follower of Christ. At first Leucippia concealed from her husband her delight, but after the infant was born, she revealed the secret to her husband and persuaded him likewise to be baptised. They named the baby Galaction. His parents raised him in the Christian faith and provided him a fine education. He could make for himself an illustrious career, but Galaction sought rather for an immaculate and monastic life in solitude and prayer. When Galaction turned age 24, his father resolved to marry him off and they found him a bride, a beautiful and illustrious girl by the name of Epistemis. The son did not oppose the will of his father; however, through the will of God, the nuptials were for a certain while postponed. Visiting often with his betrothed, Galaction gradually revealed about his faith to her, and he converted her to Christ and he himself secretly baptised her. Together with Epistemis he baptised also one of her servants, Eutolmius. The newly-illumined decided, on the initiative of Galaction, to devote themselves to a monastic life. Quitting the city, they hid themselves away on Mount Publion, where there were two monasteries, one for men and the other for women. The new monastics had to take with them all the necessities for physical toil, since the inhabitants of both monasteries were both old and infirm. For several years the monastics asceticised at work, fasting and prayer. But one time Epistemis had a vision in her sleep: Galaction and she stood in a wondrous palace before the Resplendent King, and the King bestowed on them golden crowns. This was a presentiment of their impending martyr’s end. The existence of the monasteries became known to the pagans, and a military detachment was sent off to apprehend their inhabitants. But the monks and the nuns succeeded in hiding themselves away in the hills. Galaction however had no desire to flee and so he remained in his cell, reading Holy Scripture. When Epistemis saw that the soldiers were leading away Galaction in chains, she began to implore the hegumeness to permit her to go also, since she wanted to accept torture for Christ together with her fiancée-teacher. The hegumeness with tears blessed Epistemis to do so. The saints endured terrible torments, whilst supplicating and glorifying Christ. By order of the judge they were quartered asunder. Eutolmius, the former servant of Epistemis, and who had become her brother in Christ and co-ascetic in monastic deeds, secretly gave reverent burial to the bodies of the holy martyrs. He later wrote in eulogy of their lives, for both his contemporaries and posterity.